Get the most efficient small heater for your home with our comprehensive reviews and buyer’s guide. Space heaters are a great way of heating rooms in a more efficient way. They are typically much cheaper than central heating systems, and come with energy saving features like digital thermostats and timers too. In this article, we have researched and reviewed the 10 most energy efficient heaters available. We've found the room heaters that use the smartest technology to provide heat to your home in the most efficient ways. There’s a comparison table where you can easily compare the stats that matter, and more detailed reviews to help you make the most informed decision. If you’re completely new to the world of space heaters then check out the buyer’s guide further down the page. Otherwise, read on for our top recommendations. We'll start with the 5 models that really caught our attention. You can quickly compare the features in the table below before we discuss each model in more detail. In our opinion, these are the top space heaters available right now. We’ve been careful to cover all budgets and we’ve included a wide range of heater types too. There's the Dr. Infrared model which is our personal favorite (you'll see why soon), a feature-packed 'Budget Choice', the top wall-mounted option, and the 'wildcard' gas heater which is an excellent emergency back-up. Find out about each of the models in a bit more detail. Get the key stats and features and discover exactly what we think. 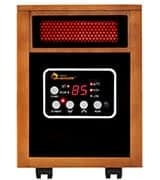 The Dr. Infrared heater is unique in our list as it is the only one that uses infrared technology to heat a room. This gives it an amazing ability to heat a space in an energy efficient, but incredibly effective way. It allows better heat distribution in a faster time, which means your room will be warm in next to no time. Unlike conventional heaters that heat air in a room, the Dr. Infrared heats objects in a room. This means that heat is not wasted as warm air rises to the ceiling. It provides a more uniform heat that remains constant and is not at the whim of drafts. This state of the art technology also retains moisture in the air. This means that your skin won’t get dried out as it can do with convection heaters that pump out hot air. Besides its modern infrared technology, this space heater comes with some other handy features. As it has no exposed heating elements, there is much less of a fire hazard or a danger to children. It also has a tip-over protection system and overheat guard that make it a heater that has safety as a top priority. In fact, it is certified by Underwriters Laboratories (UL) USA and Canada to prove it. It is controlled electronically and comes with an IR remote control. These electronic features include a 12-hour automatic shut-off timer, automatic energy saving mode, and a thermostat. The energy saving mode cycles the unit between high (1500 W) and low (1000 W) settings and also turning the unit on and off to maintain the temperature that you desire. The electronic thermostat has a range of 50 – 86 degrees. It can be controlled by the degree so that you have the most accurate way of setting the temperature. This means no energy has to be wasted like in systems that offer just two or three thermostat settings. The Dr Infrared portable heater doesn’t give out much noise either. It features a high-pressure blower that only makes 39 dB of sound. To put that into perspective, the sound of a library is rated at being around 40 dB. This isn’t the smallest of space heaters and measures 13 x 11 x 16 inches. Conveniently though, it comes on wheels so that it can be easily moved around the home. You can read more about the range of devices that Dr. Heater offer in this article. Bottom Line: This is our pick for the best energy efficient space heater. It heats rooms very quickly and effectively, and comes with some really smart energy saving modes and safety features. The Mr. Heater MH9BX is an Amazon bestseller that has an amazing reputation. Unlike most of the models that we have included in our guide to the best space heaters, this one runs on propane. This brings with it the added benefit of not relying on the electricity grid. This makes this heater the perfect solution for those living off the grid and also for emergency situations when there is no available electricity. The MH9BX has two settings of 4,000 and 9,000 BTU. The high setting is capable of heating spaces of up to 225 square feet. The fact that it runs on propane means that it is perfectly happy running indoors and outside too. The swivel regulator easily attaches to 1 lb. liquid propane cylinder, but it can be hooked up to a 20 lb. cylinder with an optional hose and filter. Unlike some propane powered devices, this unit is easily lit by simply rotating a knob and pushing the Piezo ignition button. It also comes with some excellent automatic safety modes that ensure it runs smoothly and without hiccups. These safety modes include an automatic shut-off in case of it being tipped over, a low oxygen safety shut-off (ODS), and also an automatic shut-off if the pilot light goes out. The high-temperature wire guard also means the heating element is well guarded. The system is completely portable and includes some nice features to make transportation easy. It has a fold-down handle that reduces the space it takes up and it weighs overall just 10 pounds. The ceramic burner tiles are also installed on shock absorbing insulation (like suspension) that means they can handle any bumps that the heater might receive during transportation. Bottom Line: The lack of a thermostat means this unit isn't able to regulate itself like some of the others. However, as it is propane powered it offers possibilities that the others can't match. This isn't as refined as some of the heaters with digital controls, but it is extremely reliable, durable and portable. This is also one of the best RV heaters money can buy. Stiebel Eltron are a German company known for making high quality heating and energy saving appliances. The CK 15E is a wall mounted electric fan heater that is both reliable and effective. The slim, compact design is less than 5 inches in depth so it won't eat up much space in the home. It is easily mounted on a wall, and the minimalist design means it will blend in with the room. Being wall mounted allows it to blow air downwards towards the floor, which heats the space evenly and avoids cold floors. This method of heating works really quickly too and will heat up a room in very little time. The CK 15E comes with the kind of features you would expect from a Stiebel Eltron product. It has a built-in thermostat, timer, and a frost protection setting too. These are the kind of features that only the best energy efficient heaters possess. The thermostat gives complete control over the temperature from 5–30°C allowing you to heat the room as efficiently as possible. Being a German product, it is very well engineered and reliably put together. It runs very quietly and only puts out 49 dB of sound at its maximum setting. That's very little noise for a unit as effective at heating as this one. It also comes with a really solid three year warranty to ease those anxious minds. Bottom Line: Stiebel Eltron have a great reputation for making quality heating products, and this one is no different. It's not one the cheaper room heaters, but it won't let you down. This is one of the best electric wall heaters available. The Lasko 6435 is another model that comes with a really positive reputation. 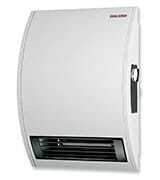 It is is competitively priced and has many features that make it one of the best value heaters available. It has three temperature settings (low, high and automatic), and built-in safety features. The real stand-out feature of this model though is its elegant design. Lasko show that a space heater doesn't need to be boxy or drab, and the 6435 is one of the best looking models out there. It uses a ceramic heating element with oscillation so that it can heat large spaces. The oscillation is able to spread heat over a wide angle and isn't noisy like some can be. It is controlled using electronic buttons on the top of the device or a remote control. The remote control is basic looking but has full functionality. It's perfect for those lazy days when leaving the sofa just isn't on the cards. The 7-hour timer can be set in intervals of one hour and allows you to get on with things and not have to worry about it. It also comes with a digital thermostat that allows it to run more efficiently. The thermostat can be changed to the nearest degree of temperature so that the heat can be controlled accurately and without wasting any excess energy. The heater will automatically adjust its settings so that the preset temperature is maintained. The unit features an automatic shut-off in case of overheating. Sadly, it doesn't have a tip-over shut-off though. I guess the timer compensates for this slightly as you can choose to have it turn off when you are not present. However, it is ETL listed, which means it has been independently tested and verified to meet prescribed safety standards. At its highest power setting, the Lasko 6435 is rated at 1500 watts of power. The heat is output into the room using wide angle oscillation. This means it can provide heat to a large area and is not just focused on a narrow point in front of it. The system runs really quietly despite having such a wide range. Bottom Line: If aesthetics and price are just as important to you as functionality, then this ceramic heater might be the one for you. The remote and digital thermostat are great features at such an impressive price point. I've used the adjective 'unique' a lot in this article, to describe various characteristics of space heaters. But, in the case of the Dyson AM09, it's hard to think of a more fitting term. Upon looking at it you would be hard pushed to guess that it's actually a heater, but that's what it is, and that's what it does very well, in its own special way. It might be conceived as having a flashy, novelty appearance, but its shape is a key feature of its design. In my opinion, it looks great and would be a standout feature in any room it is used. It is actually able to cool the room as well as heat it. This dual operation might account for its somewhat more excessive price tag. It does this using two operating modes. Let's take a look at these two methods of operation. Jet Focus Mode: This mode heats the whole room quickly. It has a wide and long range that reaches the farthest points of the room. Focus Mode: This produces a powerful jet of air in a narrower and more precise field. This mode is great if there is only one person (or point) in the room that requires heat. It saves energy by targeting exactly what needs heat. It has a long reach that means you don't have to sit in front of the heater like before. The AM09 has an intelligent digital thermostat. Once you set the desired temperature the unit will turn itself on and off as required to maintain the set temperature. This serves to save energy and stop the room from overheating. It also has a sleep timer. The timer can be set in intervals from 15 minutes up to 9 hours. The combination of thermostat and timer make it perfect for night time use. It can be left to look after itself as you sleep. All of these features can be controlled with a fully functional remote control. The AM09 is actually the new and improved version of the older AM05 model. This new version has been engineered to reduce turbulence, which in turn makes it 75% quieter. It has been awarded the Quiet Mark award by the Noise Abatement Society for its extremely quiet operation. It is the only fan heater to have received this award. The Dyson AM09 also has safety in mind. There are no fast-spinning blades or visible heating elements. It also has an automatic shut-off feature should it be knocked over. Bottom Line: This is one of the most highly efficient space heaters out there, but it comes with a price tag to match. It has some amazing design features and has the kind of reliability you would expect from a brand like Dyson. It looks terrific too! This DeLonghi space heater uses micathermic technology which makes it one of the fastest acting and most energy efficient room heaters around. It produces both convection heat and radiant heat and can reach its maximum operating temperature in just 60 seconds. The HMP1500 has three heat settings. There's the basic high (1500 W) and low (750 W) power modes, and a thermostat that allows the unit to monitor the room temperature and adjust its settings to reach and then maintain the desired temperature. The micathermic technology that this model uses allows it to be ultra thin. Though it comes on caster wheels, these can be removed and the panel then mounted on a wall. This is easily done with a kit (included) and makes a really efficient use of space. This DeLonghi heater comes with the safety features you would expect from such a powerful little heater. There's a thermal cut-off to stop it from overheating, an automatic tip-over switch, and power & caution indicator lights. As this heater doesn't use a fan, it is one of the quietest. Even at full power, the noise is minimal. Bottom Line: Micathermic technology allows this heater to have a really slim profile, but heat rooms in a quick and efficient way. Smart technology makes this one of the most efficient space heaters around. This heater from Honeywell is one of the cheapest, and also one of the smallest we have looked at. However, despite its size, it still packs a punch and is surprisingly good at heating a room. It really does offer good value, and while it is cheaper than most heaters we have looked at, it still has some great features. It has two heat settings (1500 W and 750 W), and also a thermostat. The thermostat is not a sophisticated as some of the pricier models, but its effective enough to save you money. Instead of selecting a temperature for the heater to reach and then maintain, you turn on the thermostat when the room is at a temperature you like. Then it will maintain this temperature for you automatically. The HCE200 also has the safety features of models that cost a lot more. There's an automatic tip-over switch, overheat protection, and also cool touch housing. The cheaper models usually skimp on the safety features, but certainly not this one. Further things going for this heater are its size (it's tiny), it comes with an awesome three-year warranty, and the fact it comes in a choice of colors. The one downside that we can see is the noise. While I wouldn't consider it noisy, it is certainly not as quiet as some of the more expensive models. Bottom Line: This has all the features you need and it's really well priced. It's not the most energy efficient space heater around, but as far as value goes this one is really tough to beat. This DeLonghi model is one of the most energy efficient heaters available. It uses digital controls to make sure a space is heated quickly and more efficiently. Unlike most small space heaters, this unit has three heat settings (low, medium & high), this means that when in automatic thermostat mode it uses less energy to maintain the desired temperature. Rather than heat up to the maximum setting and turn itself off, this heater has a medium setting that most heaters don't. This makes it more economical and efficient. DeLonghi call this automatic mode Electronic Climate Control, and the system will monitor and select the ideal power setting for you. It also has a massive 24-hour timer. This is among the largest built-in timers we have seen in small space heaters. The timer function allows you to program 2 different modes over a 24 hour period. This means you can set a daytime temperature and also a warmer night time one. The heater uses thermal tunnels to produce its warmth. These allow the maximum amount of radiant heat flow but maintain a safe, low surface temperature. This makes this heater perfectly suitable for homes with children and pets. In fact, it also has an automatic overheat cut-off feature too. The EW7507EB outputs 1500 watts on its maximum setting in an almost silent manner. The unit is filled with diathermic oil which allows it to operate in this way. The oil lasts the lifetime of the unit and doesn't need to be refilled. Bottom Line: One of the smarter energy efficient room heaters, as it makes a clever use of technology. One of the more expensive models we've looked at, but it's cheaper to run in the long-term than most. This is another ceramic heater from Lasko that offers some awesome features in a great value package. 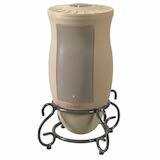 This is a ceramic tower heater that takes up very little floor space in the home. It has electronic controls that allow the temperature to be controlled accurately and to the nearest degree. By controlling temperature to the degree, no energy needs to be wasted when heating a room. It features two heat settings and also a programmable thermostat. 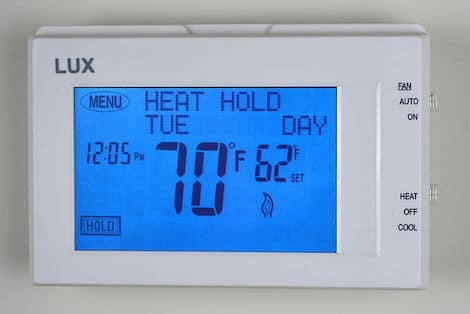 The thermostat will regulate the temperature in the room and make sure it stays constant. There is also a 7-hour timer. This isn't the longest timer out there, but it does offer a level of convenience that some other models can't match. These features can be controlled easily from the comfort of your sofa using the multi-function remote control. As it is such a tall and slender unit, it may be knocked over more easily by pets or children. Thankfully, it has an automatic shut-off function, should this ever happen. Besides the tip-over protection, there is also overheat protection to make sure it never runs too hot. The narrow output vents offer a widespread oscillation which means that it is able to heat large spaces. At maximum output, it provides a heating power of 1500 watts. Bottom Line: A great value package that takes up very little space in the home. Before making a commitment check out this guide to choosing the perfect heater for your home. Space heater energy efficiency relies on a number of features likes thermostats and timers besides the actual technology in question. In this section, we outline some key features that you should be looking for as well as offer some help about choosing the right size. 1. Match the power output to the room size. The key to getting the space heater that works in the most energy efficient way is getting one that is the perfect "size" for your room. 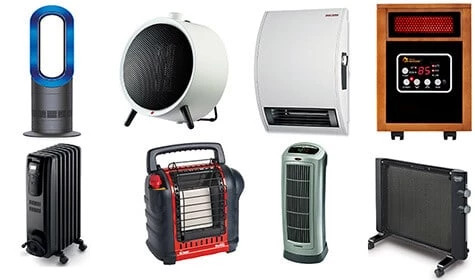 By getting a space heater that has the right power output according to the area of your room, you can ensure that is works effectively and efficiently. This can be calculated with a measuring tape, a calculator, and some simple math. Step 1: Find the amount of energy needed to heat your room. a) Measure the length and the width of your room and multiply these together. b) Multiply this number by 10 to get the number of watts of power required to heat the space. c) Multiply this number by 3.41 to get the number of Btus required to heat the space (optional). A room measures 14 feet by 12 feet. This means a heater that generates 1680 watts (W) or 5729 Btus per hour is needed to heat this space. Step 2: Find a heater that closely matches your power needs. A heater will either be rated in watts (W) or Btu. To convert from watts to Btu we multiply by 3.41, and therefore to convert the other way we divide by 3.41. This method of calculating the amount of heating power needed is a basic one and does not take the height of a room into consideration. However, it does give a valuable estimate of the kind of power you will need. 2. Does it have a thermostat? The most efficient space heaters will use a thermostatic control. This is a device that can monitor the temperature of the room and adjust the heater's output accordingly. It is able to turn off the heater when a certain temperature is reached, and even turn it back on again when the room gets to a certain temperature. You are able to predetermine these temperature thresholds according to your own preferences. A heater that works in this way is much more cost and energy efficient as it will only function when needed. Furthermore, it won't waste energy by operating at a temperature that is too hot for the room. The quality of the thermostat is also an issue that will affect a heater's energy efficiency. The more basic thermostats might only have a few settings for you to choose from. This means they are not accurate down to the nearest degree of temperature and don't have complete control. The higher quality thermostats give the user control over the temperature settings down to the nearest degree Centigrade or Fahrenheit. This means that you can run a much more efficient heating operation in your home. Fortunately, if your heater doesn't have a thermostat control, an external one can be purchased. However, the most efficient electric heaters will have one. 3. Does it have a timer? Like a thermostat, a timer can also increase the efficiency of a space heater. A timer can be set so that the heater is only on when you are present. That means when you are away, no energy will be wasted. A good example of how a timer can help you heat your home in a much more efficient way would be when using a heater at night. Instead of having the heater on constantly all through the night it can come on automatically for just a few hours at a time. Most quality heaters have a built-in timer function, but an external timer control can be purchased too. These are easily installed by simply plugging them into the power source, and then plugging your heater into the timer. 4. Does it run quietly? Space heaters are relatively small and can be very powerful. This means some of them can make a considerable noise, especially if they use fans to blow the hot air. Different methods of heating are quieter than others. Convection heaters are probably the quietest, but infrared and radiant heating methods aren't noisy either. We've commented on the noise levels of our small space heater reviews whenever possible. 5. Does it have different heat settings? The more heat settings that a heater has then the more efficient it will be. Even systems that use a thermostat will run more efficiently if they have more heat settings. Look for a model that has at least a high and low heat setting but ideally even more. Ideally, you want as much control over the heat as possible. Down to the nearest degree is perfect, otherwise as many levels as possible. By increasing the heat incrementally we can use our heating system in a much more energy efficient way. In the process, we save energy and money. 6. How much space do you have? There are wall mounted heaters, those with wheels, those that have handles, and those that are slim. If you're looking for a tiny house heater then the heater's footprint might be one of the more important aspects of your decision. Always remember that you'll need to account for reasonable clearance from flammable objects like curtains or tablecloths. These devices are loaded with safety features but they still present a fire risk. Automatic Tip-over Protection: This safety mechanism will immediately turn off the heater should it be knocked over by a pet or child. Overheat Protection: These heaters can run pretty hot if left on for long periods at high power settings. This feature means that it will turn itself off if it ever gets too hot. Low Oxygen Safety Shut-off: This one is only for the propane-powered heaters. But, it's an essential one if you have one of these devices. It will turn the unit off should the oxygen levels dip below the safe threshold. 8. Which Heating Method Should I Choose? 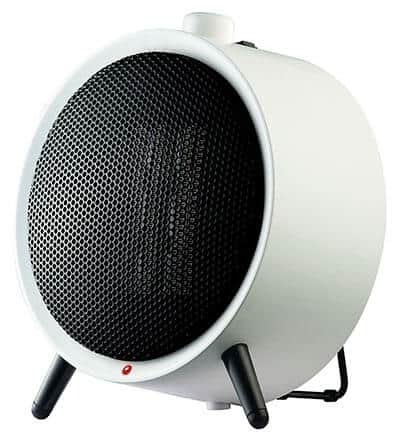 Modern space heaters come in a variety of shapes and sizes and go about heating rooms in different ways. In this section, we take a look at the three most popular methods used to heat a room. They each have their pros and cons so it's important you know what you're getting. The most efficient electric space heaters use modern technology that is a lot more complicated than simply heating an element. You might remember from science class that infrared light is beyond the spectrum of the human eye and is therefore invisible to us. An infrared heater uses this invisible light to heat surfaces in a room that absorb its light. An infrared heater gives a more even heat throughout a room. By heating surfaces, the heat does not all rise to the ceiling like with traditional heaters. Manufacturers also claim that this technology does not remove humidity from the air and make it "dry". By retaining the moisture it is kinder to your skin. 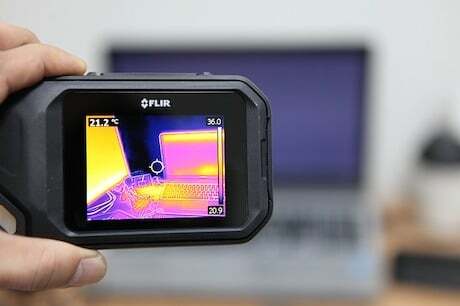 The main positive about infrared technology is that it is very energy efficient. The Dr Infrared model that we review is a great example of one of these heaters. These use a ceramic element that is heated by electricity before the heat is transferred throughout the room by a fan or oscillator. Ceramic elements tend to be more energy efficient and safer than traditional heaters. They heat up and cool down faster than regular metal coil heaters. The Lasko 6435 Designer Series is a top rated ceramic heater. Micathermic technology is another new one. It is special because it combines the two main methods of heating a room. A micathermic heater doesn't waste electricity in the heating up process. By using an electrical resistor it can maintain an efficiency of very close to 100% in the warming process. It also radiates heat very well using a silicate mineral which has very good heat transfer properties. Micathermic heaters are able to heat the air like regular heaters, and also radiate infrared heat to heat surfaces in a room. The DeLonghi HMP1500 Mica is a micathermic heater that we recommend. Ceramic heaters are tried and trusted devices that are powerful and reliable. However, emerging technologies like infrared and micathermic are leading the way in energy efficiency in the home. The most efficient electric heaters use these technologies. 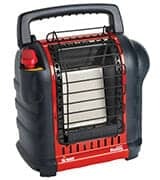 If you need something completely portable that isn't reliant on the electricity supply then gas or propane powered heaters are ideal. They are typically less refined but more powerful than most electric devices. The different technologies used in heating rooms offer slightly different safety concerns. Some also work better in different locations within a room. For a start, while some propane heaters can be used indoors you'll still want to be very careful about keeping them away from any objects that may easily catch fire (this goes for all heaters but especially those with very hot heating elements that can be exposed). An example of a dangerous fire hazard could be curtains that might blow in the wind or thick carpets with fine fibers. Then there are kerosene heaters where proper ventilation is absolutely essential to safe operation. You might also be tempted to go for a garage heater, as these are designed to heat large spaces with high ceilings. These are NOT suitable for households as there are just too many combustible objects. They also usually lack some of the more refined safety features that you would expect from a household heater. 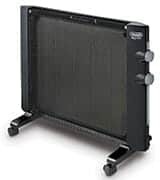 If you have small children or energetic pets in your home then perhaps a wall mounted heater is the best option for you. This removes the chance (however small) of a heater ever getting knocked over. The better heaters will turn off automatically if this ever happens but they don't all have this feature. Before spending money on what could be an expensive heater, make sure you've exhausted all the other possible solutions. 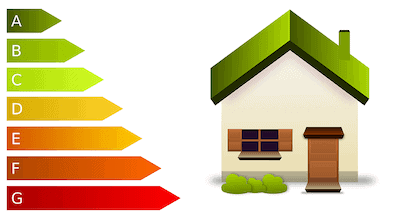 Here are some tips on how you can reduce the energy bills and save energy in your home. Regularly maintain your furnaces/stoves/filters. For something like a wood stove to run efficiently, it must be checked and maintained every so often to make sure there is no build up affecting how it heats your home. The same can be said for AC units, furnaces, and other combustion devices. Try and set the thermostat as low as is comfortable in the colder months. Don't waste money and energy by having the home excessively warm. The heat can be supplemented by more economical methods like burning wood or peat or using a space heater. Why heat the whole house when you are occupying just one room? Get rid of the trapped air from hot water radiators every year. A professional can do this if you aren't sure. Improve energy efficiency by placing reflectors between the wall and radiators. This is relatively cheap and can be bought with adhesive backing which is easily applied to the wall. Use weather stripping around doors and even windows to eliminate cold air drafts. Plug any holes in exterior walls with expanding foam. Again, this is to stop any drafts coming in. Use the sun whenever possible. Keep your curtains open during the day, especially ones that face south and let more sunlight in. For maximum gains, make sure you cut back any trees or bushes that might block any sunlight from entering your home. For further ways to lower your energy bills at home make sure you check out our guides to thermal curtains and efficient ceiling fans. You'll be surprised at how much of a difference they can make. These devices create an incredible amount of heat energy and they should, therefore, be treated with caution. These are some basic safety tips that will help reduce the risk of a fire accident. Read the manual carefully before use, and follow the manufacturer's safety guidelines. Make sure your heater is positioned away from areas where there will be passing foot traffic. Though some of them have automatic tip-over shut-offs, it's best to prevent this from happening in the first place. Don't use extension cables. These can overload. Be aware of any flammable materials in the room, and make sure the heater is at a distance from them. If the heater doesn't have a timer or overheat shut-off then it's best to not leave it unattended. Never try to repair a broken heater by yourself. Contact the manufacturer or an official repair shop. It would be remiss of us to tell you which model is best for you without knowing your circumstances. We've suggested which one we'd choose over all others (the Dr. Infrared space heater) but you really need to do your homework first to decide which one suits your lifestyle best. If you haven't read our buyer's guide yet then this can really help you in making a decision. We love the way infrared heating technology works and with no exposed heating elements it's amongst the safest methods for homes with pets or children. However, it might not suit everyone. Anyway, we've done our best to offer a wide range of models that each offer something a little bit different. If you have any questions about anything you've read here then be sure to get in contact and we'll do our best to answer them in a prompt and informative manner. That brings us to the end of our massive guide. Don't miss our Facebook group where you can see articles like this on a regular basis. While on the subject of heating, we also have a great guide to wood stoves here at Tiny House Huge Ideas. Your information was most helpful. It is rare that I would take the time to read thru an entire article, but I found this informative and precise. In other words…….you kept it “short and sweet” yet, on point. The information given has enabled me to decide on which space heater would be best for the space needed to be heated. Thanks so much….